Cardinal Mooney High School Senior, Matthew Rossi, has accomplished an academic Trifecta of sorts. This month, Matthew was named a National Merit Semifinalist by scoring a 1490 out of a possible 1520 on his PSAT. In addition, Matthew received a perfect ACT Composite score of 36. 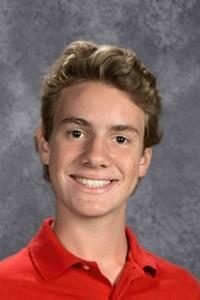 Considering these outstanding accomplishments and Matthew’s current GPA of 4.653, this Cardinal is on the verge of even greater things, looking toward Stanford or the University of Notre Dame to further his studies next year, majoring in Biochemical Engineering. Being named National Merit Semifinalist puts Matthew in contention for one of 7,500 National Merit Scholarships. His ACT score is earned by only one-tenth of 1 percent of the more than 2 million students that take the exam annually. Matthew’s scores on these tests along with his impressive GPA have been accomplished while he maintains a full extracurricular and athletic schedule including CMHS Soccer Captain, Co-President of Interact Club, member of the Tennis Team, Academic Challenge, Service Club, Gardening Club, Theatre Department and Debate Team member, along with his service as a school Music Minister. He has lettered in Soccer, Tennis, and Academics. Matthew, a Holy Family Parishioner and Alumnus, is encouraged by his parents, Ms. Becky Distad and Atty. Gregg Rossi of Poland and Youngstown, respectively. Matthew’s Cardinal Mooney Family also supports him in his pursuits and eagerly looks forward to his future successes.